In the second set it was New Haven who came out firing and Union finding themselves fighting to comeback. The Rocks took the second set 25-18, forcing a third set. Rachel Steinhoff had a game high 7 kills in New Haven's loss to Union on Tuesday night. Coach Hoener said, “I think we used the momentum we gained at the end of the first set to carries through the second set. The worst nightmares for any coach are injuries, particularly when it’s one of your best players and even worst the last game of the season. 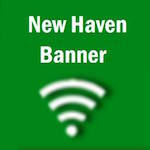 Forget the fact New Haven went on to loss the third set, 25-20, ending a three game winning streak. Early in the third set with New Haven leading 14-9, Hoener’s nightmare became a reality. The Shamrock’s team leader in kills, points served, aces, and a three-year starter came down on her left shoulder while diving for a tipped ball. Peacut would not return and concerns of the severity of her injury. Whether or not she will be able to play on Monday is questionable. Fortunately by Monday Peacut will have had a full weeks rest. New Haven will make the two-hour drive to Bismark on Monday to play Crystal City in the first round of districts.